Police in Gloucestershire are using a mobile camera that can catch offenders from up to a kilometre away, as part of a new road safety operation. On 14 November, the force launched Operation Indemis, a new ‘collaborative approach’ to improve the safety of some of the county’s busiest roads, including the A417/419 – a major strategic route that links Gloucestershire with Wiltshire as well as the M4 and M5. Unlike traditional speed guns, which can only measure the speed of vehicles, the new camera produces ‘clear, high-quality’ video footage and photographs. It means that driving offences such as mobile phone use and failing to wear a seatbelt, can now be detected before a driver is aware of the camera. 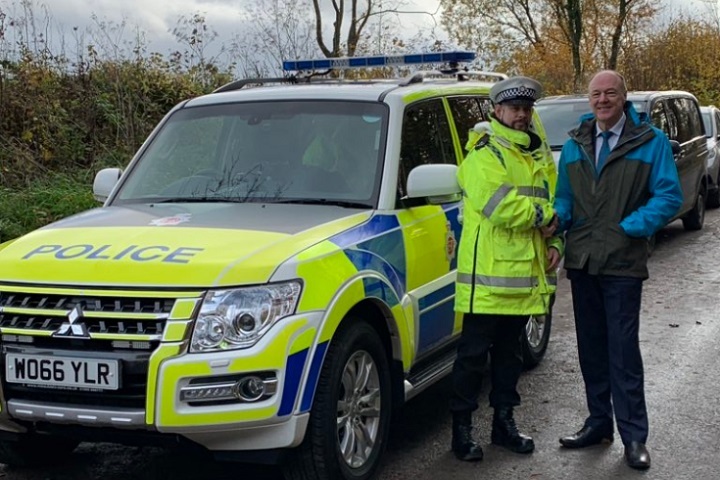 Martin Surl, Gloucestershire’s police and crime commissioner says the aim of the operation is not simply to penalise motorists – but to ‘uphold the law by creating a change in people’s behaviour’. The project will be evaluated at the end of the year, against a range of measures currently being developed, to determine its longer term sustainability and benefits. Mark Soderland, chief inspector, Gloucestershire Police, said: “A core aim of the approach is collaborating wherever possible with other road safety stakeholders. “The team has started with Highways England and (Gloucestershire) County Council and is now approaching groups such as the Motor Insurers Bureau and the DVSA to explore what opportunities there might be to work together and improve safety. “Criminality is also important to the operation. Having a police presence on a strategic road such as the A417 is an excellent opportunity to prevent and disrupt criminals entering the county. Hence the use of the vehicle’s ANPR and intelligence briefings. As with so many things, the press got this story completely round their necks! Firstly, Op Indemnis has nothing to do with “new” cameras. The launch of Op Indemnis (a dedicated vehicle to police the A417/A419 to reduce KSIs and tackle criminality) happened to coincide with the (unrelated) release of footage from the Camera Safety Unit showing off their new cameras, that’s all. The press combined the two in their quest for some interesting footage. Secondly, whilst the tailgating footage might look impressive, it is yet to be tested in court. Without concrete evidence of the following distance and speeds of the vehicles concerned, using such footage to prove a tailgating offence may be problematic. Don’t get too excited! Bob, Nigel – as ‘national interventions’ to deter speeding, phone use, drink-driving etc etc don’t work, why would such an intervention to deter tailgating have any effect? To put it bluntly, we’re dealing with people who cannot and will not be told and who think they know better! Enforcement via cameras – official and personal dashcams – are the best bet – provided the police follow them up, as one man’s close-following is another man’s safe distance. I hope that many of the drivers who are “caught” on camera will be offered an educational course, rather than giving them a fine and fixed penalty. Explaining the dangers of tailgating and their other wrong-doing will do more to persuade them to change their behaviour than simply punishing them. Spot on, Bob, particularly on your original comment. More please everyone. The organisation I used to work for were using speed cameras to catch these other offences (other than speeding that is) fifteen years ago Bob – that was my point. I think that what they are commenting on is the different usage of such camera equipment. It not being used merely to catch speeders but all sorts of actions that are questionable and maybe illegal. A spy at a distance instead of having to actually be within visual striking distance of san offender. The possibility is that if drivers become aware that they are now more likely to be caught doing something they shouldn’t and something that is illegal and receive penalty notices for it then they may think twice about committing such acts. Anything like this which makes ‘Enforcement’ easier may have a salutary effect on the mindset of the general driving public. The manned speed cameras have always been able to take ‘clear, high-quality’ video footage and photographs’ haven’t they?. What’s new here? With an effective National intervention to reduce tailgating I summise some 80% plus of rear end shunts would be eliminated . Tailgating is the greatest cause of all collisions including failed to view and/or recognise speed at many junctions and that included roundabouts. Sort out Tailgating and we sort out a lot of collision that could easily be avoided by the giving of safe following on distances.